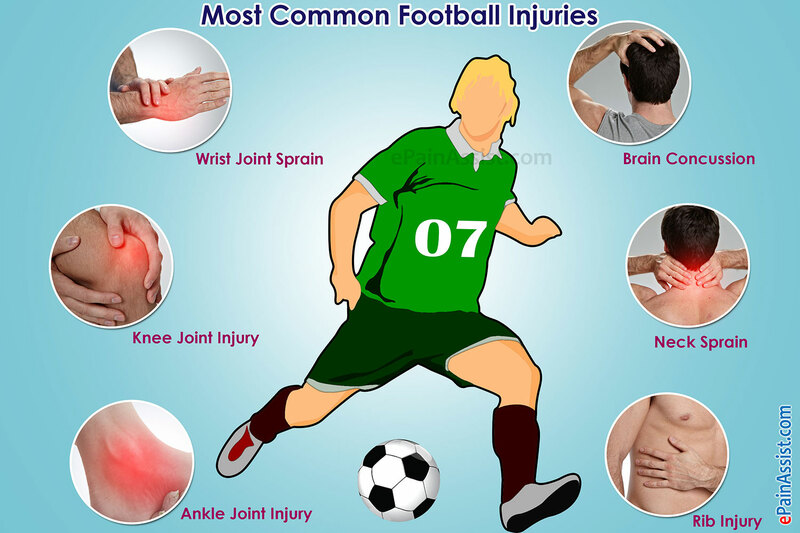 Approximately 231,447 athletes were treated in hospital emergency rooms for soccer-related injuries in 2012, according to the US Consumer Product Safety Commission. Warm up and stretch. Always take time to warm up and stretch, especially your hips, knees, thighs and calves. Research studies have shown that cold muscles are more prone to injury. Warm up with jumping jacks, stationary cycling or running or walking in place for 3 to 5 minutes. Then slowly and gently stretch, holding each stretch for 30 seconds. According to a study reported in the February 2007 issue of the American Journal of Sports Medicine, youth soccer players (ages 2 to 18) suffer around 120,000 injuries each year sufficiently serious to require a trip to a hospital emergency room. The total number of soccer-related injuries, including those treated outside of a hospital ER, is estimated to be nearly 500,000 per year. 1.Reduce injuries through proper conditioning. Conditioning-related injuries, such as strains and sprains occur most often at the beginning of a season when kids are most likely to be out of shape. Such injuries are preventable if, before the start of a season, a child follows a conditioning program designed specifically for soccer. Proper conditioning is particularly important for girls. Not only are girls predisposed to instability or dislocation of the kneecap (patella), pain and problems under the kneecap, but the twisting and cutting in soccer make them particularly vulnerable to non-contact injuries of the anterior cruciate ligament (ACL), which they suffer at a rate two to ten times higher than boys. Proper conditioning (especially building up hamstrings and inner quadriceps muscles) and teaching girls to pivot, jump, and land with flexed knees and employ a three-step with the knee flexed instead of a one-step stop with the knee extended have been shown to prevent some of these injuries. 2.Reduce injuries through proper stretching, warm-ups and cool-downs. Research shows that cold muscles are more injury prone and athletes with poor muscle flexibility experience more soreness, tenderness and pain after exercise. Unlike sports like gymnastics or swimming, soccer does not develop natural flexibility. As a result, stretching, particularly of the groin, hip, hamstrings, Achilles tendon, and quadriceps, during warm-ups before practices and games and during the cool-down after playing, is particularly vital in reducing the risk of strains and sprains. Stretching is particularly critical for soccer players between the ages of 10 and 13 who have less natural flexibility because their bones are growing faster than their muscles. It is also critically important for girls, who need to strengthen and stretch leg muscles to reduce the risk of ACL injuries. 3.Reduce injuries by properly maintaining the field. By some estimates, fully 25% of all soccer injuries result from poor field conditions. Don’t leave it to the referee to check the field for holes, puddles, broken glass, or stones or other debris. Be proactive by setting up a field detail. 4.Reduce injuries by wearing proper shin guards. One recent study revealed that among one league of youth soccer players, the shins were the third most likely area to be injured. Of the seventeen fractures, four were to the tibia (shinbone). The study confirmed that shin guards significantly decreased the force to the tibia compared to impacts without shin guards. Make sure the shin guards meet appropriate safety (i.e. ASTM) standards. 5.Reduce injuries from goal post collisions. Soccer goalies suffer a disproportionate number of injuries, many from absorbing the impact of colliding with the post of a heavy, stationary, unpadded goal post. A study by the Consumer Product Safety Commission (CPSC) concluded that padded goal posts significantly reduced the number and severity of such injuries, and were especially effective in reducing head injuries. In another study of 471 soccer games using a goal post padding system developed by Dr. David Janda, an orthopedic surgeon and director of the Institute for Preventive Sports Medicine in Ann Arbor, Michigan, there were seven major collisions between a goalie and the post, but no injuries. Reduce orofacial injuries by using mouth guards. As many as 30% of all soccer injuries are to the orofacial region, including tooth avulsions, tooth fractures, concussions, and oral lacerations. Many of such injuries could have been prevented had the player worn a mouth guard. Yet only about 7% of youth soccer players wear mouth guards all or most of the time, and few state interscholastic athletic associations mandate their use. Both the American Academy of Pediatric Dentistry and American Dental Association recommend a sports mouth guard for soccer. Take steps to reduce the risk of concussions and other traumatic brain injuries. Two recent studies suggest that years of heading a soccer ball may result in the short term in weaker mental performance, including a decline in cognitive function, difficulty in verbal learning, planning, and maintaining attention; and reduced information processing speed. The long-term effects of heading, however, are less clear. The studies have led some groups, including the National Soccer Coaches Association of America to recommend that its members not stress heading drills among children 10 or younger. Players, coaches, parents, referees, and health professionals need to be educated about the injury potential from heading a soccer ball; rules on the distance of players from the ball on restarts (such as free and corner kicks) need to be strictly enforced; and balls should be of the size and weight appropriate for the players’ age and be made of synthetic, nonabsorbent materials when games are played on wet fields (because leather balls, when wet, become heavy and water-logged, increasing the risk of injury). Reducing overuse injuries by setting participation limits. Nearly half of all of the sports injuries children suffer each year are overuse injuries. There are a number of commonsense steps parents can take to reduce the risk of overuse injuries. First, before letting a child play on two or three soccer teams at the same time, consider that all the extra wear and tear on her body may lead to overuse injuries years later. Second, set limits. A child is far less likely to suffer an overuse injury if he takes off at least three months a year from sports, and practices and plays soccer no more than twelve hours per week. Be prepared for medical emergencies. A properly stocked first-aid kit should be available at all soccer practices and games, youth sports coaches should receive training in first-aid and an emergency medical plan should be in place. Continuous upkeep of the playing surfaces. Will insure that players are not entering the season with preexisting injury. Insures that rehabilitation is complete. Ask how the injury occurred: “Where did you get hit?”, “did you twist you leg?” etc. Rest- removes the player from the game. Ice- applies ice to the injured part. Elevation– elevates injured body part above heart if possible. Abrasion– A loss of surface area of the skin caused by sliding on the field surface. CARE: Clean area with antiseptic to prevent infection. An antibiotic ointment may be used to keep wound moist and prevent infection. Cramps– An involuntary contraction of a muscle or muscle group that is repetitive and rapid in nature. CARE: Hydrate with water and stretching. Concussion– An injury to the brain. May complain of headache, ringing of the ears, dizziness, and blurred vision. CARE: Seek immediate medical attention.